After eight years of restoration work, El Capitolio, or National Capitol Building has re-opened to the public. El Capitolio was the organization of government in Cuba until after the Cuban Revolution in 1959, and is now home to the Cuban Academy of Sciences. El Capitolio's design is compared to that of the United States Capitol, but is not a replica of it. In 1929 when it was completed, it was the tallest building in Havana and houses the world's third largest indoor statue, the Statue of the Republic (La Estatua de la República). Please advise your favourite language. All visits are on request, we will confirm time and availbilty after receiving your requets. To request more information about CAPITOLIO GUIDED VISIT, please email sales@cubaism.uk. Special tour of the Historical Center of Havana. Visit to the Scale Model of the Historical Center to become acquainted with the area to be visited. Walking tour along the main streets and squares of the Historical Center (Plaza de Armas, Plaza de San Francisco, Plaza Vieja and Plaza de la Catedral). Presentation of the City Historian's Office the cultural institution of the territory. To request more information about COLONIAL HAVANA TOUR, please email sales@cubaism.uk. To request more information about HAVANA ARCHITECTURE TOUR WITHIN THE CITY WALLS TOUR, please email sales@cubaism.uk. A tour that will provide the knowledge of the wide spectrum of practiced religions in Cuba and the emergence of syncretism. Visit to the Regla Museum. Visit to the Sanctuary of the Virgin of Regla. Visit to the Hammel’s Alley. Visit to Las Mercedes Church. Visit to the Greek Orthodox Church. Visit to the Religious Art Museum at the St. Francis of Assisi’s Basilica. Walk by the Synagogue Adath Israel. Walk by a Protestant Church. To book or to request more information about RELIGION IN CUBA TOUR, please email sales@cubaism.uk. Visit to Cuban art at the Fine Arts Museum. Visit to the Wilfredo Lam Centre. Visit to the Center for the Development of the Visual Arts in the Old Square. Visit to the Experimental Workshop of Havana at the Callejón del Chorro. Visit to studios of famous artists and private art galleries (The occurrence of these visits will be subject to the availability of the artists). ** Lunch/Dinner: supplement 25.00 CUC. Complete Menu with 1 drink in one of the following restaurants: Restaurant El Mercurio at Lonja del Comercio in Plaza de San Francisco, Restaurante Café Taberna in Plaza Vieja, Cervecera Antiguo Almacén del tabaco y La Madera in Avenida del Puerto, Restaurant La Imprenta, in Calle Mercaderes between Lamparilla and Amargura, Private Restaurant: Cuba 54, Habana 61 y El Figaro. To request more information about ART AND COLOR TOUR, please email sales@cubaism.uk. The best way to discover the secrets of an ancient tradition in the land of the best cigars of the world. Visit to a Cigar Factory. Visit to the Tobacco Museum. Meeting with tobacco rollers and show of their skills. Shopping opportunity at specialised and authorised cigar stores. To request more information about HABANOS, A TRADITION OF EXCELLENCE TOUR, please email sales@cubaism.uk. Discover a part of Cuban history by getting to know the popular tradition linked to bars and small grocery stores, where board games and bests for the payment of the next round were common practice. During the first decade of the 20th century, Havana experienced the opening of famous bars that played the leading role in the Golden Age of Cuban cocktails in the days of the Prohibition in the US and favoured the first cocktail making competitions and the creation of the Cuban Bartenders Club. Visit to the Rum Museum. Tour of the most famous bars of Old Havana to taste flavoury Cuban cocktails. To request more information about BARS & MEMORIES TOUR, please email sales@cubaism.uk. Santo Angel is a peripheral neighbourhood of Havana Historic Centre, often portrayed by renowned Cuban writers and artists. Exchange with leaders of the Community Art Court Project, founded in 1999 by the barber Gilberto Valladares. Visit to the alleyway of the Barbers, galleries showing the work of local artists and a specialised textiles shop. Visit to the Hairdressing Museum and School (where you might have an haircut, not included in this tour). To request more information about SANTO ANGEL NEIGHBORHOOD FROM INSIDE TOUR, please email sales@cubaism.uk. Havana Bay has been recently cleared up for the re-establishment of the Luz Pier as a dock and terminal for the small boats that link Havana with Regla and Casablanca. Thanks to this project, old buildings, the piers and an impressive waterfront promenade have been recovered, giving a new wave of charm to the port. Visit to the other side of the bay, where the city landscape has a charming and more popular look, including traditions and religions. Visit to the brewery in the former tobacco and timer warehouse, the handicraft fair in the former San Jose warehouse, the Sanctuary of Our Lady of Regla. Visit to the viewpoint at the Cristo de la Habana. To request more information about ON BOTH SIDES OF THE BAY TOUR, please email sales@cubaism.uk. Havana's emblematic concert halls are located in buildings of high artistic and patrimonial values and now host renowned musical groups and singers in theme festival and exquisite concerts. Visit to former s. Francis of Assisi Church. Visit to Ignacio Cervantes Hall. Visit to Paula Church (Iglesia de San Francisco de Paula). Visit to the historic Amphitheatre. Visit to Mozart Centre at St. Philip of Neri Oratory. **** For this tour, location and schedule is indicative and it changes on monthly basis. Please check with our sales team the concerts available on date(s) requested. To request more information about OLD HAVANA IN CONCERT TOUR, please email sales@cubaism.uk. This specialised tours focuses on the contrast between colonial atmosphere of stone-paved streets and squares with the modern look of the main neighbourhoods forming the so-called Modern Havana., characterised by the architecture of the 1950s and early years of the Revolution. Visit to the Historical Center: Plaza de Armas, Plaza de San Francisco, Plaza Vieja and Plaza de la Catedral. Visit to Havana downtown, Central Havana. Visit of Vedado and Miramar. Panoramic ride on the Streets of Reina, Carlos III, Malecon (the waterfront avenue) and Quinta Avenida (Fifth Avenue). To request more information about THE WHOLE CITY TOUR, please email sales@cubaism.uk. A specialised tour that will allow a full appreciation of Havana outside the city walls; settlements that have appeared since the end of the 18th century and have been consolidated through the 20th century. Visit to the Scale Model of the City to understand the urban development of the city. Tour of Miramar: an exclusive and residential neighbourhood built from the 30's through the 50's with visit to La Maison as an example of the domestic architecture. Tour of Vedado, an example of the modern city planning (beginning of the 20th century). Approach to emblematic constructions such as the López Serrano and Focsa buildings (Art Deco and Modernism), and the visit to the Hotel Nacional de Cuba (eclecticism). Tour of the Havana Malecon, seafront. Visit to the Casa de La Amistad, former residence of Doá Catalina Laza and evidence of the residential Art Deco from the beginning of the 20th century. To request more information about HAVANA ARCHITECTURE BEYOND THE CITY WALL & URBAN DEVELOPMENT TOUR, please email sales@cubaism.uk. The system of colonial forts around the bay of Havana still shows the need for defence of the village of San Cristobal de la Habana (St. Christopher of Havana), turned into port of call for the Spanish fleet and target of pirates and corsairs. Visit to the remains of the former city walls. Visit to El Morro and La Cabana fortresses. Visit of the village of Cojimar. To request more information about THE PROTECTED KEY TO THE NEW WORD TOUR, please email sales@cubaism.uk. From the Colonial period until the early years of the Revolution, Havana experienced immigration not only from Spain and Africa, but also from people of different nationalities. Through their different ethnic traditions, habits and cultures, immigrants contributed to the creation of a unique national identity. According to the route chosen, you will visit characteristic emblematic buildings and important places. To request more information about TRANSCULTURATION AND RACIAL MIXTURE TOUR, please email sales@cubaism.uk. Tour showing the city with a new, unusual look by visiting different viewpoints in privileged locations and having high historical-cultural values. Visit of the Christ of Havana. Visit of the viewpoint of the obelisk of Plaza de la Revolucion. Visit of the tower restaurant on top of the FOCSA building. To request more information about HAVANA FROM ABOVE TOUR, please email sales@cubaism.uk. Visit to sits with pieces like Giraldilla, symbol of Havana city. Visit to the monuments to Maximo Gomez, Antnio Maceo and Calixto Garcia. Visit to the sculptures of the Capitolio, the Nobel Havana, el Parco de la Fraternidad, the university of Havana, the Plaza de la Revolucion and the Christopher Columbus Cemetery. To request more information about HAVANA AND ITS SCULPTURES TOUR, please email sales@cubaism.uk. During the 50s, Havana became the place that received celebrities looking for glamour and leisure and at the same time, the country had a difficult social situation and a secret revolutionary movement was in place. Through this tour, you will discover amazing places visited by famous Hollywood actors and feared gangster of the American mafia, many fashionable spots that still preserve their charm and museum rooms which recreate the Cuban reality of that time. To request more information about UNRAVELING THE HAVANA OF THE 50s TOUR, please email sales@cubaism.uk. In the last years of the 70s, a new movement appeared in the Cuban Visual Arts, breaking with the pictorial traditions and aimed at experimental artistic creation, questioning and social criticism. Visit to the collection of Cuban art at the National Museum of Fine Arts. Visit to galleries, studios, workshops and neighborhood projects of the main figures of Contemporary Cuban Art. To request more information about CONTEMPORARY ART TOUR, please email sales@cubaism.uk. This tour gives an approach to the Cuban photographic heritage. Visit to well-known cultural institutions, exhibitions, projects and workshops. Meeting with acclaimed artists and new talents. Visit to photo exhibition galleries, studios of photographers. Passing by interesting spots for amateur photographers. To request more information about FACES & SIGHTS OF THE CITY TOUR, please email sales@cubaism.uk. In the recent years, Havana has experienced the increase in the number if environmental education projects, the development of sustainable urban agriculture and the boom of the ecological gastronomy. Visit to Quinta de los Molinos and areas of the Metropolitan Park. Visit to a farm and community garden with lunch in a restaurant related to the topic. ** The Tour includes lunch at one of these restaurants ¨El Divino¨ or ¨Rancho Vista Hermosa¨. To request more information about HAVANA IS ALSO GREEN TOUR, please email sales@cubaism.uk. An approach to the different stages of the program for the preservation, restoration and safeguard of Havana's heritage as well as to the social program for the benefit of the local population carried out by the City's Historian Office. Presentation of the City Historian's Office the cultural institution of the territory; with explanation of the unique approach to the management model based on self-financing and of the principles supporting the responsible development of tourism in Havana. Lecture on centres and institutions related to social assistance. Visit the local school of trade. To request more information about CITY'S HISTORIAN OFFICE, RESTORATION & SOCIAL WORK TOUR, please email sales@cubaism.uk. Pick from your Havana hotel at 8.30 am and departure to Playa Larga through Guama (Ciénaga de Zapata). Visit to to crocodiles farm and boat trip to Taino Village, a reconstruction of a pre-columbian village. Continuation to Cienfuegos, one of Cuba’s best-preserved city, sometimes called La Perla del Sur (Pearl of the South). City Tour with visit to Tomas Terry Theatre and cocktail in Palacio del Valle. In the afternoon, continues to Trinidad. ** Rates shown are in CUC (Cuban Convertible Pesos). Please note, you will be charged in GBP, based on mid-market rate of exchange on the date of paying. To request more information about EXCURSION HAVANA-GUAMA-CIENFUEGOS-TRINIDAD, please email sales@cubaism.uk. Day tour combining old and modern Havana. Walk tour though the Historical Centre, declared World Heritage Site by UNESCO. Visit 4 squares: Plaza de Armas, Plaza de San Francisco, Plaza Vieja and Plaza de la Catedral. Tour with panoramic view of modern part of Havana in classic car through Malecon, Quinta Avenida (5th Avenue) and stop in the Revolution Square with time available for photos. To request more information about HAVANA DAILY TOUR with panoramic tour in classic car, please email sales@cubaism.uk. Visit the Coffee plantation and the ruins of the old coffee plantation of the area "Cafetal Buena Vista"
Continuation to La Moka Villa, visit Casa de Polo Montañez (Cuban guitarist Trova Music), art galleries, Café de Maria (Special Coffee of the Area). Lunch at local Restaurant (included). In the Afternoon Canopy Adventure, unique zipline tour through the tropical treetops. Free time for swimming in the San Juan river (don't forget your swimsuit!). Return to Havana hotel before dinner. To request more information about LAS TERRAZAS EXCURSION, please email sales@cubaism.uk. Day tour in the nature - from Havana Pinar del Rio & Viñales, where some of the world’s best tobacco is grown and turned into unique cigars. Viñales is also well known for its distinctive landscape dotted with gigantic "mogotes" (karst formations) surrounding a lovely valley with rich, red earth and majestic palm trees. In 1999, the Viñales Valley was designated a UNESCO World Heritage site. Departure from Havana hotel at 8.30 am to Viñales. Panoramic tour through Viñales Valley. Visit to La Cueva del Indio (an ancient indigenous dwelling) and tour in motor boat through an underground river. Visit to the Mural de la Prehistoria, painted by Leovigildo González Morillo. Visit of a tobacco plantation and learn how cigars are rolled. To request more information about EXCURSION TO PINAR DEL RIO AND VIÑALES, please email sales@cubaism.uk. Explore in one day the wonders of Cuba's capital, Havana on e-bike with an expert Cuban guide, not only specialised in your language but also skilled in mechanics. Meet in Parque Mariana Grajales in Vedado and pick up the e-bikes, short introduction of the program, control of the e-bikes and traffic information. Ride towards the lively Habana Vieja, cycling by Callejón de Hamel, the center of the Afro Cuban Santeria scene in Centro Habana and stopping at La Guarida, shooting location thanks to the movie Fresa y Chocolate (Strawberry and Chocolate), nominated for the Oscars in 1993. Cross the town and ride on the Malecon and through the elegant residential district of Vedado with is many different styles of architecture; continue to La Rampa and finally arrive at the Revolution Square. Finish the tour with a refreshing cocktail, beer or soft-drink. Included in the price: E-bike and Helmet; Guide (English, German, Spanish- other languages, on request); 1 bottle of water 500ml; lunch (with 2 soft drinks). ****Please provide number of males, females and kids taking part to the group including information about any specific conditions regarding body height and weight. There is no minimum age, but minimum height of 1.40 mn (4.60 feet). Seats for kids (up to 25 KG) available on request. To request more information about ONE DAY IN HAVANA ON E-BIKE, please email sales@cubaism.uk. Explore the historical places of the Revolution in Havana on E-bike with an expert Cuban guide. This is the opportunity to discover in person in one day Cuba’s past and the present. Start in Parque Mariana Grajales in Vedado with short introduction of the program, control of the E-bikes and traffic information. Cycle in front of the former Hilton Hotel (now Habana Libre) and through the narrow streets of Centro Havana until the Museo Nacional de Bellas Artes and Museo de la Revolución where you can see the Yacht Granma (you won’t visit the interiors in order to spend more time cycling). Carry on to Paseo del Prado, Havana promenade built in 1772 and inpired by the Ramblas of Barcelona and Madrid and then to the Malecon towards the recently reopened USA Embassy. Continue to La Casa de Las Américas and the Revolution Square and then back to the starting point. To request more information about CUBAN REVOLUTION ON E-BIKE, please email sales@cubaism.uk. Discover Ernest Hemingway's favourite places in Havana on E-bike with an expert Cuban guide. Cycle to Hotel Ambos Mundos and visit Hemingway's room, where the writer stayed when he first arrived in Cuba. Explore the suburban area, enjoying beautiful views from Finca Vigía, Hemingway's winter residence from 1940 to 1950. As a good fisherman and art lover, he quickly earned the respect of the other fishermen in Cojimar and they affectionately started to call him Papa. Lunch at the restaurant in Cojimar, where the famous writer also used to eat. On the way back, pass through the little village of Villa Panamericana to enjoy one of the most beautiful views over the bay from the El Morro fortress. Cross the bay on a little ferry to end the tour enjoying a Mojito at the Bodeguita del Medio. To request more information about HANG LIKE HEMINGWAY ON E-BIKE, please email sales@cubaism.uk. ¡VAMOS A LA PLAYA! ON E-BIKE! ¡Vamos a la playa! Escape the the busy city life in Havana on e-bike and enjoy the tropical beach in Playas del Este. Cross the bay of Havana by ferry, then continue on e-bikes through a picturesque route, discovering many rural villages in the provinces of Guanabacoa, Minas and Regla. Enjoy a swim in the transparent, turquoise waters at Playa Santa Maria del Mar and have aa tasty seafood lunch at the restaurant "El Ranchon". After enjoying the beach, head back to Havana on a different route, passing through Alamar, Cojimar and Casa Blanca. Cross the bay by ferry and return to Old Havana. Clothing & Recommendation: Sneaker or closed shoes, sunglasses, sun protection, swimsuit, beach towel, etc. Included in the price: E-bike and Helmet; Guide (English, German, Spanish- other languages, on request); 1 bottle of water 500ml; lunch (with 2 soft drinks); ferry transport. Book Now ¡VAMOS A LA PLAYA! ON E-BIKE! To request more information about ¡VAMOS A LA PLAYA! ON E-BIKE!, please email sales@cubaism.uk. This eBike tour will take you to explore the forgotten side of Havana: Regla, Casablanca and Guanabacoa. You will experience the authentic Cuban harbour life, learn more about the Santeria, an Afro-Caribbean religion with some Roman Catholic elements added, visit the statue of El Cristo de la Habana and enjoy a stunning view from its hilltop. Cycle to La Rampa, in front of the previous Havana Hilton (today Habana Libre) and Nacional hotels, along the Malecon until the ferry port, where you will embark "La Lanchita", a ferry used almost exclusively by Cubans. Cross the bay of Havana by ferry, then continue on e-bikes through a picturesque route, discovering many rural villages of Regala, Casablanca and Guanabacoa. Here you will learn how Havana was built to defend itself against foreign attacks, the origins of the Santeria and the history of the African slaves. Carry on to the fisherman village of Cojimar, often frequented by Hemingway. Visit la Comandancia del Che in the Fortaleza San Carlos de la Cabaña and the Castillo de los Tres Reyes del Morro. Included in the price: E-bike and Helmet; Guide (English, German, Spanish- other languages, on request); 1 bottle of water 500ml; lunch (with 2 soft drinks); ferry transport; entrance of Museum Municipal de Guanabacoa. Book Now HAVANA BAY ON E-BIKE! To request more information about HAVANA BAY ON E-BIKE!, please email sales@cubaism.uk. This eBike tour will take you on an authentic journey through Havana countryside along the west coast and Marina Hemingway for some of the best seafood in Havana. This journey off the beaten track will put you in direct contact with the Cuban lifestyle and culture and take you to some of Cuba best-known artists’ studios. Ride through the Embassies district and Palacios de las Convenciones. Cycle to the fishing town of Jaimanitas, almost forgotten until Jose Rodriguez Fuster turned it into Fusterlandia, a living piece of art. Projected started with Fuster decorating the exterior of his house with intricate mosaic embellishment and slowly taking over the entire neighbourhood. Today it shines brighter than ever as the finest example of Cuban ingenuity, flamboyance and colourful flair. Continue towards Marina Hemingway, with Cuba's largest yacht club. Carry on to the small beaches of Santa Fe and Playa Baracoa. Stop for seafood-based lunch. Cycle back to Vedado with a stop at Bar Hemingway for a refreshing drink. Included in the price: E-bike and Helmet; Guide (English, German, Spanish- other languages, on request); 1 bottle of water 500ml; lunch (with 2 soft drinks)t.
To request more information about LA HABANA CAMPO - THE UNKNOWN WEST, please email sales@cubaism.uk. This eBike tour will take you through the most popular spots and districts of Havana. This tour is ideal if you are only spending a short amount of time in Havana and would like to maximise your time. Cycle through Vedado, Centro Habana and Habana Vieja, passing in front of Museo de La Revolucion, Prado, Parque Central, El Capitolio and arriving at the historic train station of Havana. Ride along Havana bay and to the fortress El Castillo de La Punta, from where you can admire El Castillo del Morro and San Carlos de la Cabaña, while learning a bit more about Cuba history and culture. Cycle along the Malecon and to Columbus Cemetery, ending the tour at Parque John Lennon before heading back to the starting point. Included in the price: E-bike and Helmet; Guide (English, German, Spanish- other languages, on request); 1 bottle of water 500ml. To request more information about HALF DAY IN HAVANA, please email sales@cubaism.uk. During this evening eBike trip, you will ride through Havana streets and experience the city's magical atmosphere by night. Cycle along the Malecon, from where you can hopefully experience a stunning sunset, through Plaza de la Revolución and the stadium Latinoamericano, home stadium of the Industriales, the Havana’s baseball team. Carry on to Habana Vieja to admire El Capitolio, El Gran Teatro de La Habana Alicia Alonso, El Parque Central, Manzana de Gomez, El Prado, Hotel Inglaterra and so on. Continue to Habana Centro, Neptuno, San Nicolas and Galliano, originally called Avienida Italia. Pass in front of the notorious restaurant La Guarida and stop at Callejon de Hamel to learn about the afro-american religion Santeria. Head back to the meeting point passing in front of the former Havana Hilton (now Habana Libre) and Nacional Hotel. Departures: Monday - Sunday. April to September 7.00 pm and October to March 6.00 pm. Clothing & Recommendation: Sneaker or closed shoes, light raincoat, etc. Included in the price: E-bike and Helmet; Guide (English, German, Spanish- other languages, on request); 1 bottle of water 500ml; snack (with 2 soft drinks). To request more information about HAVANA BY NIGHT, please email sales@cubaism.uk. During this evening eBike trip, you will ride from the Malecon, Havana seaside promenade, to Regla and Casablanca, an almost forgotten part of the city, centre of the Santeria and former slave trade. The eastern part of the bay has maintained its charm and originality and it is rarely visited by tourists. Be prepared for a stunning night view of Havana! Cycle through La Rampa, passing in front of the former Havana Hilton Hotel (now Habana Libre), Nacional Hotel and the riding along the Malecon. Cross the bay of Havana by "La Lanchita" ferry, used almost exclusively by Cubans. Visit of the church of Nuestra Señora de Regla and then head to El Cristo de La Habana, from where you will get a unique view on Havana. Visit from the outside La Comandancia del Che, La Fortaleza San Carlos de la Cabaña and rge Castillo de los Tres Reyes del Morro. Head back to Old Havana by ferry and stop for a snack and a refreshment before going back to the starting point. Included in the price: E-bike and Helmet; Guide (English, German, Spanish- other languages, on request); 1 bottle of water 500ml; snack (with 2 soft drinks); ferry transport. To request more information about HAVANA BAY BY NIGHT, please email sales@cubaism.uk. Tropicana is a very well known Cuban Club in Marianao, inaugurated in 1939; home to the famous Tropicana Cabaret show, also known around the world as a 'Paradise Under the Stars'. It hosts more then 200 first-rate dances, singers, performers and fabulous orchestra on it is open-air stage. There is a capacity for 1000 people around the stage in the main salon 'Bajo las Estrellas', however for those who prefer quieter environment Tropicana has other spaces, 'Los Jardines' restaurant, the bohemian 'Café Rodney', etc, although nothing can be compared with the great salon under the stars, one of the most legendary places in Havana. The show is every night, from 21:00 till midnight. Dress code: smart and elegant (no jeans, shorts, vests, sandals, etc). Bookings in advance are highly recommended as the show gets sold out quickly. To request more information about CABARET TROPICANA, please email sales@cubaism.uk. Located in the famous Hotel National, Parisien night club enjoys the same prestigious history as the hotel and offers a downscaled version of the Tropicana, closer to the city centre. 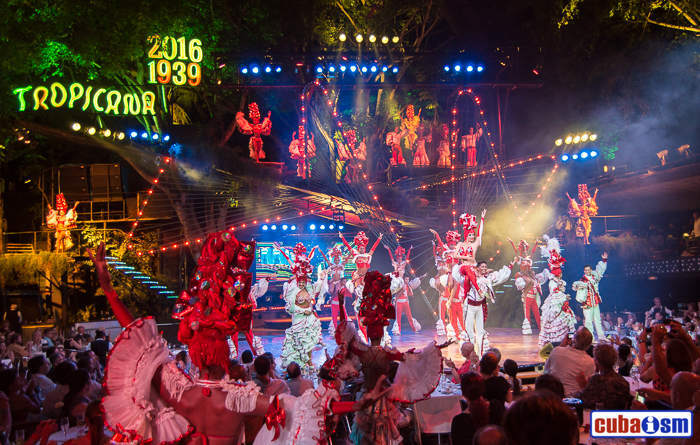 Vibrant, extravagant and spectacular shows, Cuba Libres and delicious food will make you feel like in paradise. And if you are tired of music, you can have walk in the hotel’s gardens and enjoy the sea breeze. The show is every night, from 21:00 till midnight. Dress code: smart and elegant (no jeans, shorts, vests, sandals, etc). Bookings in advance are recommended. To request more information about CABARET PARISIEN, please email sales@cubaism.uk. Named after the year when hotel Nacional was incepted, Salon 1930 Cabaret and Restaurant is middle-sized night club, lavishly decorated and permanently chilled even in the devilishly scorching summer days. One of the best Havana bars, The Hall of Fame, is located in Salon. The walls of bar are peppered with black&white photos of famous mafiosos and other vintage celebrities usually associated with them. The mojito served here is appropriately named The Mafia Mojito. There is a live music almost always played in the establishment. The club was known to be dedicated to Compay Segundo (legendary cuban singer of Buena Vista Social Club fame) and very often you can find a tribute band playing music of the great man. To request more information about CABARET SALON 1930, please email sales@cubaism.uk. If you wish to book city tour(s) please fill in the form below and we will contact you shortly for payment.